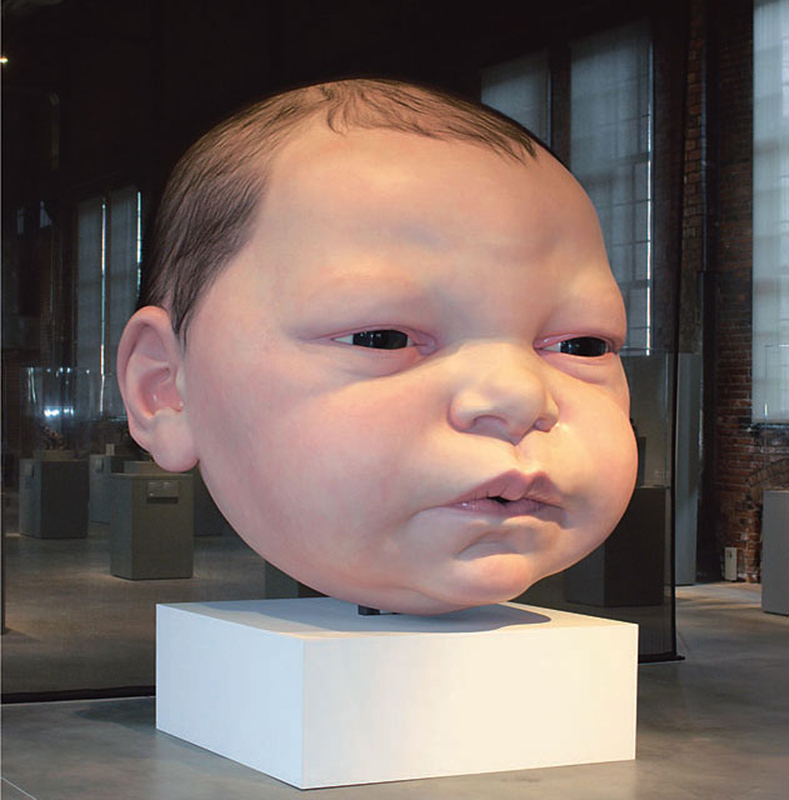 Untitled (Head of a Baby) is definitely a sculpture of the spawn of Satan. This decapitated baby head just oozes evil. Through those dark, innocent-looking eyes lies the soul of a killer. I mean, it’s definitely an inanimate object but Chucky was just a doll and look what he did. With the exception of it being gigantic, it’s also just a little too life-like for a sculpture. You can almost see blood pumping through the kid’s cheeks and his hair is exactly like that of a newborn. Usually people are drawn to newborn babies, but this 7 foot gargantuan is more than a little creepy. It’s exactly what you would find in a bad horror film like Chucky or in the subpar sequel of Honey, I Shrunk the Kids, Honey, I Blew Up the Kids. The reason the sculpture is so life-like is because Mueck pours over every single detail of the work. He adds layer upon layer of paint and gets in even the subtlest of colors in the baby’s face. Every single individual hair is put in one by one by hand to get that super soft, Gerber baby look (though this is no Gerber baby). He gave it as much care and attention as he would give an actual child, which is either a little crazy or super cool. That’s up to you. Glentzer, Molly. "Ron Mueck's Hyperrealist Sculptures Go On View Sunday At MFAH". Laredo Morning Times. N.p., 2017. Web. 15 May 2017. "Untitled (Head Of A Baby)". Cybermuse.gallery.ca. Web. 15 May 2017. Nagy, Attila. "Cite A Website - Cite This For Me". Gizmodo.com. N.p., 2013. Web. 15 May 2017. Ron Mueck’s sculptures are jarring when you see them in person. They look so realistic it is scary. And I’m gunna go ahead and say it: this giant baby head freaks me out. The artist’s work is often described as “unsettling” because of the impossible proportions. I also happen to think that evil lurks behind those glassy black eyes. The process of construction is incredibly impressive, though. Layers of oil paint are applied painstakingly to mimic the look of real skin. You can almost see the blood pumping through the capillaries of the baby’s cheek. The hairs on its head are applied one by one by hand into the silicone and resin scalp, giving the illusion of the soft coif of a newborn. So I commend the artist on the extraordinary attention he pays to detail…just as long as his decapitated bundle of joy doesn’t come to life and start terrorizing the city.